Eating a bowl of porridge every morning is how Rhys Runciman says I will make it to 102-years-old – the same age he turned this week. 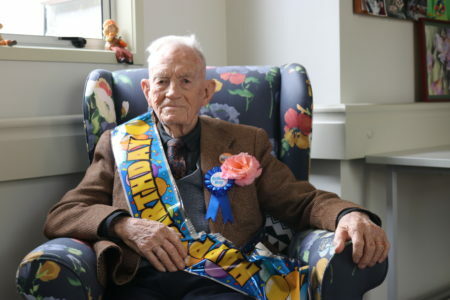 The centenarian was born in 1916 and on Tuesday he celebrated his birthday with his friends at the HBH (Howick Baptist Healthcare) Day Care programme. This is where Rhys spends two days per week, and the rest of the week he lives independently out in the community. Tears were shed as everyone chimed in to sing happy birthday. Rhys was joined by his son and daughter Roly and Lenore who joined in on the birthday celebrations. “I’ve had a wonderful life, I’ve travelled and had my family and I don’t think I could ask for anything more,” he says. The former engineer says his approach has always been about taking it one day at a time. “Just appreciate every day, and one day you’ll wake up and you’re 102. And then you’ll wonder, where did the time go?” he smiles.